Three suspected child traffickers who sold three siblings at N2.7 million have been arrested by men of the Ondo State Police Command. 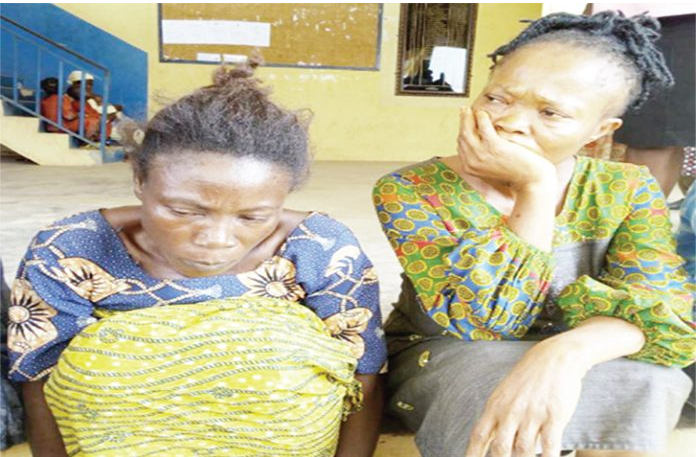 Uchena Ezewenke, Nkiru Victoria and Augustine Anyanwu, were said to have sold their victims to three different persons in Asaba, Delta State. Ezewenke and Nkiru, who were paraded by the police on Wednesday, confessed to the crime. The three children of the same parent are Stephen Jude, four years; Monday Stephen, two years and Faith Stephen, 10 years. They were reportedly taken away by one of their co-tenants at No 12 Ayeyemi Street, Ile-Oluji, Ondo State and sold at N900,000 each. One of the suspects, Nkiru, said she bought one of the children from Augustine at N600,000 and re-sold it to Uchena at N900,000. “I asked them to verify the source before selling the kid to me. I even consulted my pastor before transacting the business to know if it was a pure business,” she said. Another suspect, Ezewenke, said she decided to adopt the child because of barrenness, adding that she had been married for over 20 years without a child. The suspect, 45, said she perpetrated the act for her to be entitled to her husband’s wealth. Patience Stephen, mother of the victims, said she left four of her children at home on that fateful day while going to the farm but met only one of them when she came back. She said: “The eldest of the children told me they went to night vigil with one of our co-tenants, Esther, who had just spent about six days in our house. Femi Joseph, the state Police Public Relations Officers (PPRO), said two of the suspects were arrested in Asaba, Delta state. Joseph said one of the suspects, Augustine, had earlier been charged to court while other suspects will soon appear in court. 0 Response to "Female Child Traffickers Who Sold Three Siblings At N2.7Million, Arrested (Photo)"